25. Is the future of farming vertical? 36. Research Analyst, Environmental Integrity Project, Washington, D.C.
(Tuesday-Thursday, April 17-19, 2018) Despite intense demand for cybersecurity professionals around the world, competition for roles in the global cybersecurity workforce—especially for those just starting out—remains fierce. To help college/university students get a head start on an in-demand cyber career, and support faculty in this effort, your local ISACA chapter is offering the Cybersecurity Fundamentals Study Guide as a complimentary “Career Starter” gift—exclusively to students and institutions of higher learning. From 5:50-9:30 p.m. daily in room C41, Hayden Library, Arizona State University, Tempe campus. Cosponsored by LightWorks®. More information and registration. (Wednesday, April 18, 2018) Krista Kemppinen will discuss tools and scenario monitoring for achieving the United Nation's Sustainability Development Goals. From 12:00-1:00 p.m. in room 401, Wrigley Hall, Arizona State University, Tempe campus. More information and registration. (Wednesday, April 18, 2018) While researchers and policymakers increasingly call for societal transitions towards comprehensive urban water sustainability, much of the discussion has focused on management systems and not the role of urban residents. Few studies examine the impact of residents on water sustainability transitions, despite the significant role of the public in enabling or constraining options. Our studies have addressed this gap. Join us from 12:00-1:30 p.m. at the Decision Center for a Desert City, 21 E. 6th St, Tempe, AZ. More information and registration. (Thursday, April 19, 2018) Joni Adamson, Department of English and Environmental Humanities Initiative, Arizona State University will present Management or “Building Relationships”? Metaconcepts for Designing Desirable Futures from 5:30-6:30 p.m. (5:00-5:30 p.m. reception) in the Student Success Center, F-wing 1st Floor, Bateman Physical Sciences Center, Arizona State University, Tempe campus. More information and registration. (Friday, April 13, 2018) Mark Larson will present Boeing 787 Dreamliner: Anatomy of a Money-Making Machine from 2:00-3:30 p.m. in room 130, Santa Catalina Hall, Arizona State University, Polytechnic campus. More information. (Monday, April 16, 2018) Jeffrey Gray, Johns Hopkins University will present Predicting and Engineering Protein Complex Structures from Antibodies to Glycoproteins from 10:45 a.m.-12:00 p.m. in the Auditorium, Biodesign Institute, Arizona State University, Tempe campus. More information. (Monday, April 16, 2018) Kaushik Chatterjee, Indian Institute of Science will present Nanoscale Engineering of Materials for Orthopedic Applications from 1:30-2:30 p.m. in the Auditorium, Biodesign Institute, Arizona State University, Tempe campus. More information. (Wednesday, April 18, 2018) Rebecca Page, University of Arizona will present Combating Antibiotic Resistance through Biophysics and Structure from 12:00-1:00 p.m. in the Auditorium, Biodesign Institute, Arizona State University, Tempe campus. More information. (Wednesday, April 18, 2018) Klaus Lackner, Center for Negative Carbon Emissions and School of Sustainable Engineering and the Built Environment will present The Role of Negative Emissions in Stabilizing the Climate from 12:00-1:00 p.m. in room 5536, Coor Hall, Arizona State University, Tempe campus. More information and rsvp. April 1 may have brought tricks and pranks, but Arizona State University's plans for Earth Month are no joke. 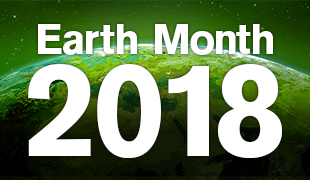 Centered around Earth Day on April 22, which has been celebrated annually around the world for nearly the 50 years, Earth Month looks to further raise awareness for those who are still living in the dark when it comes to taking care of the planet. ASU plans to do its part over the next few weeks, sponsoring more than 20 different events through April 27. Read more. Dogs — they’re our best friends but there’s still a lot we don’t know about them: what they daydream about, if they’re really smiling, why they’re scared and how we can help. And until Dug the dog’s magical speaking collar from “Up” becomes available on the mass market, we’ll have to use other means to find out. Read more. A century ago, fresh produce had no choice but to be local and seasonal, but technology changed all of that. Innovations in refrigeration and transportation allowed food production to concentrate in regions that could produce a wider variety of crops all year round. Today, the U.S. has one-third as many farms and three times as many people as it did a century ago. Read more. Application deadline April 18, 2018. More information. Application deadline April 20, 2018. More information.